With the ARION 500 and 600 series, CLAAS offers versatile, all-round tractors with a high level of comfort and convenience which are equally suited to field and grassland work, transport and front-loader activities around the yard. CLAAS now presents a new generation of these proven series with enhanced equipment options, a wider range of engines and many new features. These include the new CIS+ system, the new CEBIS terminal, updated HEXASHIFT and CMATIC transmission functions and the PROACTIV front axle suspension, newly developed by CLAAS. Thanks to the basic CIS, the new CIS+ and the deluxe CEBIS, three different equipment options are now available for models in the ARION 500 and 600 series for the very first time. All versions are available with a HEXASHIFT powershift transmission; alternatively, the CIS+ and CEBIS versions can be supplied with the continuously variable CMATIC transmission. The CIS version has been kept deliberately simple with mechanical spool valves and the CIS display, while CIS+ offers electronic spool valves and the CIS colour display as standard. Both versions have the proven multifunction armrest with ELECTROPILOT four-way control lever and DRIVESTICK to operate the transmission. The CEBIS version goes even further, featuring the fully redesigned CEBIS terminal with 12-inch touch display and intuitive DIRECT ACCESS as well as the CMOTION multifunction control lever, which can be operated using just three fingers. The power output range of the ARION series has been extended upwards and downwards. It now stretches from 125 hp in the ARION 510 to 185 or 205 hp in the ARION 660 thanks to CLAAS POWER MANAGEMENT (CPM). In the ARION 660, CPM provides a boost of up to 20 hp for transport and PTO work. All the ARION 500 models have a 4-cylinder engine, while the ARION 600 tractors have a 6-cylinder engine throughout. In the ARION 600 models the engine idling speed is automatically reduced from 800 to 650 rpm when the tractor is stationary, delivering additional fuel savings. All the engines meet the requirements of the Stage IV (comparable to Tier 4) emissions standard thanks to a combination of EGR (cooled exhaust gas recirculation), diesel particulate filter (DPF) and SCR catalytic converter (selective catalytic reduction). Despite the inclusion of an AdBlue tank, the diesel tank capacity has been increased slightly. The proven HEXASHIFT powershift transmission in the new ARION series has undergone further development under practical conditions and offers a wide range of new additional functions. These include a cruise control function where the forward speed selected by the driver is maintained automatically at the optimum engine speed. The engine therefore operates independently of the current task and is highly fuel-efficient at all times. The integrated SMART STOP function makes for very convenient handling. When the brake pedal is pressed, the transmission disengages automatically – there is no need to use the clutch pedal. This reduces the driver's workload, especially during clutch-intensive tasks such as front loader work and making round bales. The continuously variable CLAAS CMATIC transmission in the ARION 600/500 models uses a new generation of software which incorporates many customer requirements identified under real-world conditions and further refines engine-transmission coordination. For example, cruise control can be deactivated with the accelerator pedal, and the transmission adjusts more rapidly to the job in hand as the driver can switch between two saved engine droop values simply by pressing a button. All new ARION 500 and 600 models can be fitted with the new PROACTIV front axle suspension, developed by CLAAS. The tractor weight is optimally supported on the front axle thanks to the triangular arrangement of the two suspension cylinders which are angled outwards. 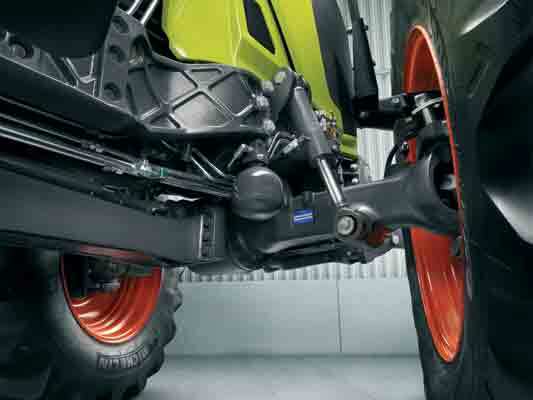 Intelligent control of the PROACTIV front axle suspension also provides active roll stabilisation on bends and reduces pitching movements during braking and acceleration. This guarantees optimum ride comfort even when driving at high speeds on roads, tracks and fields, and increases safety when driving with heavy implements attached as it prevents the tractor/machine combination from bouncing. 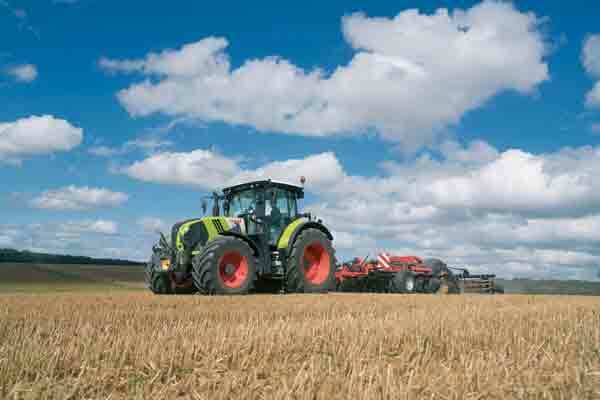 The new ARION 500 and 600 models are also available with the CLAAS dynamic steering system. In this system the driver can change the number of turns of the steering wheel needed to achieve the same steering lock and adjust the steering to the current task, simply by pressing a button. Adjustment takes place in two different automatic programs, each with two levels, and a manual program with four intensity levels. This makes handling much faster and easier, especially during steering-intensive work using the front loader or at the headland. All models are available with an updated range of cabs. Each version offers the same generous amount of space, a continuous front window and optimum visibility, including a good view of wide implements at the rear. Customers can also choose between the familiar 5-pillar cab with wide access and a door which only protrudes a short distance, and a 4-pillar cab with a continuous field of vision to the driver’s left. The 4-pillar cab is already in use on the larger AXION 900 and 800 models. The new ARION 500 and 600 series are available for the first time with the electronic Parklock parking brake on the REVERSHIFT shuttle lever. If the driver leaves the seat without engaging the Parklock, the parking brake on the tractor and any attached implements/trailers is activated to ensure that the tractor does not roll away and cause an accident. In addition to the previous load-sensing hydraulics delivering 110 l/min, there is also a new version with 150 l/min flow rate. For the ARION 630 models and above, 42-inch rims and a maximum tyre diameter of 1.95 m are now available on request, allowing plenty of tractive power to be transferred to the ground while protecting the soil. The new CLAAS ARION 500 and 600 will be available from autumn of 2017.